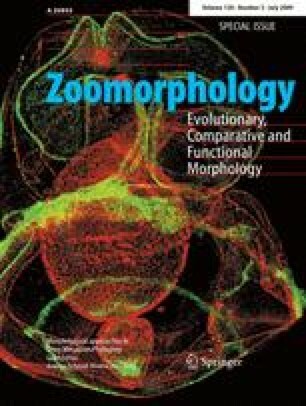 The Ecdysozoa-hypothesis on the origin of arthropods questions the homology of segmentation in arthropods, onychophorans, and annelids. The implication of convergent gain of metamery in these groups seems to conflict particularly with the correspondence in the development of serial coelomic cavities and metanephridia. Ultrastructural studies of the mesoderm development in Onychophora revealed that main correspondence with the state in annelids concerns the involvement of epithelial lining cells of the embryonic coelomic cavities in the formation of the visceral and somatic musculature. The significance of this correspondence, however, remained unclear as comparable data on the state in arthropods were still missing. Developmental studies on selected representatives covering all major arthropod subgroups aim to fill in this gap. Data were raised by a combination of transmission electron microscopy and fluorescent stainings of the muscular system and nuclei for the anostracan crustacean Artemia salina. In this species, putative transitory coelomic cavities proved to be absent in all trunk segments. In the second antennal and second maxillary segments small, compact nephridial anlagen develop into a sacculus and excretory duct. The sacculus originates from the terminal cells of the nephridial duct, which is formed in advance. The lumen of the sacculus is inconspicuous in its earliest functional stage and later enlarges to a bulb; it accordingly represents no remnant of any primarily large coelomic cavity. The muscular system is entirely formed prior to and independent of coelomic or nephridial anlagen. Visceral and somatic mesoderm already separate in the caudal body region. Transitory segmental clusters of mesodermal cells are composed of somatic cells only and accordingly represent no “somites”. Our observations overall do not provide any support for the homology of coelomic cavities in annelids and arthropods. Our project on the mesoderm development in arthropods is supported within the priority programme “Deep Metazoan Phylogeny” of the German Research Foundation (DFG-project Ba 1520/9). We thank Alexander Suh (FU Berlin) for rearing the animals, and Jörn von Döhren (FU Berlin) for his help with the fluorescence staining. Suggestions on the manuscript by two anonymous referees are also gratefully acknowledged.